In the Waterberg biosphere reserve, Marakele is packed full of wildlife and stunning bush landscapes. The park is actually setup in two sections - to gain access to the wilder second half where all the Big 5 roam in abundance, you press a buzzer to get through a gate. Head to the vulture viewing point up a very steep road where the endangered Cape vulture hangs out in relatively large numbers. From here the majesty of the landscape can be fully appreciated. I enjoyed cruising the first section of the park too where easy gravel roads allowed effortless viewing of zebra and antelope such as kudu - the bulls with their glorious spiral horns looking like serious contenders for antelope of the park award. Keep an eye out for species that are harder to spot in other parks such as mountain reedbuck, giant eland and wandering tsessebe. If it has been wet, check what access is like in the second section of the park before venturing in. Oh, and if you have a hankering to capture lumbering rhino on film you’re in for a treat, with high density populations, especially white rhino. Marakele offers a rousing taste of the Waterberg Mountains, with its landscape of grassy valleys beneath red cliffs. Visiting this rugged corner of Limpopo province is more about the scenery than the wildlife, although the park does have the world's largest colony of endangered Cape vultures (more than 800 breeding pairs). Several species of raptor can be seen catching thermals throughout Marakele. I drove up to the vulture-viewing point one sunset, feeling thankful that I didn't meet many cars coming down the precipitous road. Having enjoyed the panoramic view of dusky blue bluffs, I gingerly descended to the excellent accommodation at Tlopi Tented Camp. Overlooking a dam, Tlopi's furnished tents each have an outdoor kitchen with braai – perfect for braaing a steak and, if you’re lucky, seeing antelopes at the dam. The park's animals include lions, leopards, black and white rhinos, elephants and brown hyenas, though sightings of predators are rare. 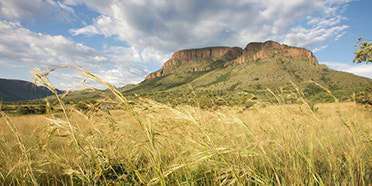 With grass-clad hills and deep valleys, Marakele is probably the best place to appreciate the Waterberg Mountains. The drive up to the mountain-top Sentech Towers is a must and the views are spectacular. The park is home to some 800 breed¬ing pairs of Cape vulture, and on a good ‘thermal’ day, they can be seen from this lookout point soaring below. Zebra, giraffe, elephant, and numerous ante¬lope like eland, kudu, impala and tsessebe are often seen, and there’s an excellent chance of seeing both black and white rhino. But don’t go to Marakele just yet for amazing sightings of predators; although some lion, cheetah, wild dog, brown hyena, and leopard have been introduced, the park is still in its development phase and these are rarely seen. But for now Marakele offers leisurely game-viewing of plains game in a peaceful environment and is a manageable drive from Johannesburg. Marakele National Park is possibly the most underrated South African national park. It is a perfect microcosm of the Waterberg region in which it is found, with ruggedly beautiful landscapes, ancient rock formations, lush vegetation, plenty of wildlife, few tourists and stacks of potential. The Big 5 are all here, though sightings of predators are rare. Elephants and rhinos are a better bet, while there are very healthy populations of various antelope species. This is also the only park in South Africa where I’ve seen a black mamba – something that still haunts my bush nightmares. Marakele’s vulture-viewing point affords the rare opportunity of seeing relatively large numbers of the endangered Cape vulture, while the difficult road to get there ensures that you won’t share the spectacle, and the panoramic view, with many other visitors. In fact, most of the park remained characteristically quiet on my recent visit – while Marakele undoubtedly deserves more visitors, this was a large part of the allure for me.